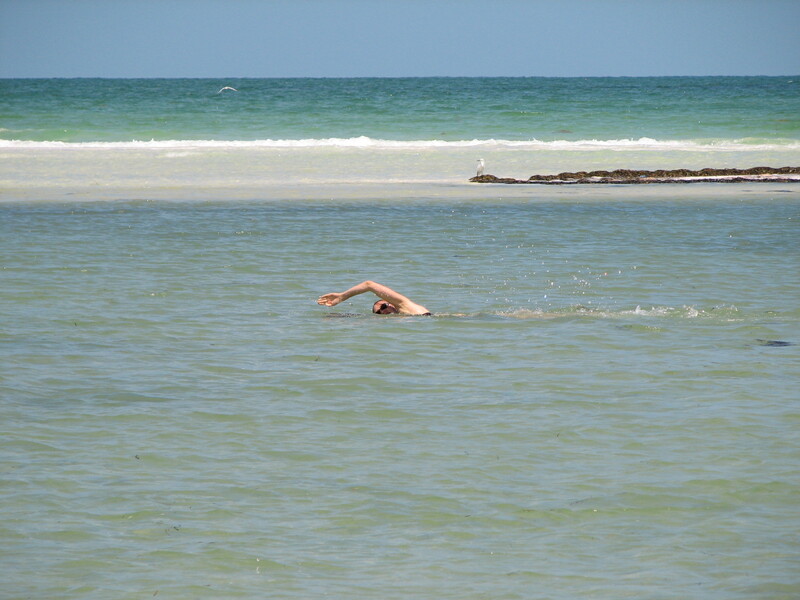 Race preview: Daiquiri Deck Tropical Splash Open Water 5K Swim in Sarasota, Fla.
I’m all packed up and ready to go to the Daiquiri Deck Tropical Splash Open Water 5K Swim in Sarasota, Fla., tomorrow! This time tomorrow, I'll be doing this. I had a nice, easy swim yesterday to loosen up my muscles. I’m taking today off, which makes sense for traveling, anyway. I’ll leave my parents’ house in (relatively) nearby New Port Richey, Fla., by 5 a.m. (gulp) for the start tomorrow, shortly after 7 a.m. I haven’t quite put in the training yardage/meterage I’d hoped to for a number of reasons, including a week or two off for a tweaked shoulder, so I’m treating this as a catered open-water workout at which my sweet, kind husband and parents happen to be cheering for me from the sidelines. The course starts and finishes on the beach. The 5K race (there’s also a 1K and 2.5K, whose competitors are undoubtedly saner souls) follows the shoreline out and back, then repeats the same 2.5K course. Last year’s results show that a whopping 10 women competed the race, with times ranging from 1:16 to 2:06. I’ve swum close to 30-minute miles in previous open-water swims, but I’ve been better-trained for those, and am promising not to beat myself up if this race time includes a little bit of double-arm backstroke. I’ll post race updates and photos as soon as possible (read: once I’ve spent some well-deserved time relaxing on the Daiquiri Deck). Wish me luck! Tons of luck! And have fun – it looks beautiful! Swim like a shark and have fun out there! good luck and have fun!! soak up some rays!